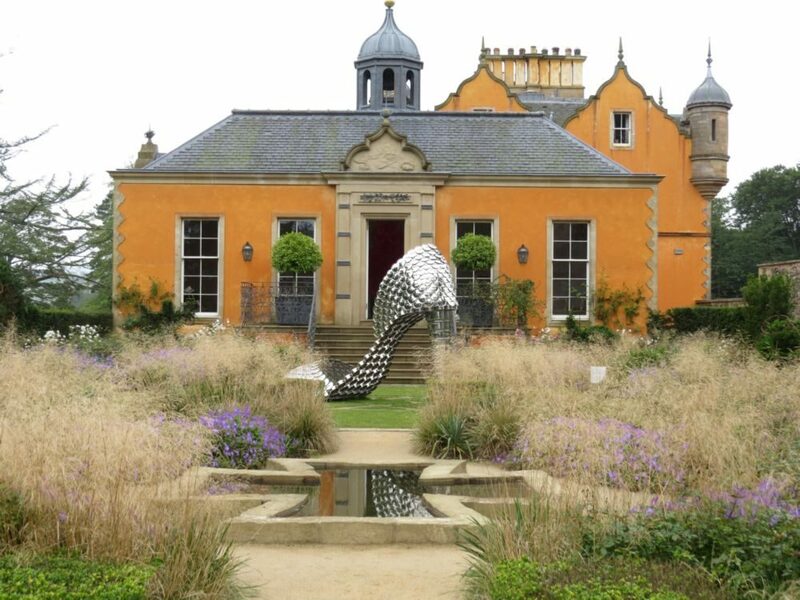 Visits to sculpture gardens carry high hopes, but I usually come away feeling disappointed, in part due to the subjective choice but also because an artwork is not something to be viewed in isolation. So often wealthy galleries and private collectors buy trophy artworks and then look around for somewhere to put them. At Jupiter Artland, just five miles from Edinburgh, the approach is holistic and I believe this is the key to its success. Sculptors are commissioned to create site-specific pieces and encouraged to take the lead and give their imagination free rein. The result is something joyful and uplifting with smaller pieces nestling into heavily shaded woodland and spectacular landform architecture created in open meadow land. Upon moving to the Scottish Baronial-style Bonnington House the Wilsons first call was to Charles Jencks, creator of the hugely influential ‘Garden of Cosmic Speculation’ close by in Dumfries, (- somewhere I have always wanted to visit but regrettably it is only open one day a year; as such it falls outside the remit of ‘The Garden Visitor’). 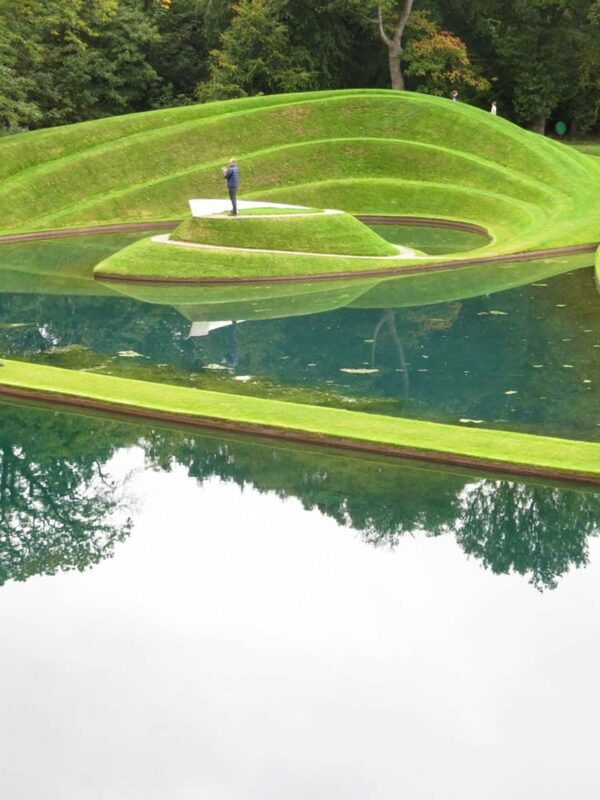 Jencks became their mentor and advisor for the layout of the sculpture park, and proposed the ‘Cells of Life’, his vast landform which has been an on-going project since the Artland was first conceived in 2004. Much of Jenck’s work as a landform designer is based on scientific processes intended to celebrate nature, such as genetics, cosmology, waves and chaos theory, however I think landforms such as pyramids, mounds and standing stones touch something primeval in our nature. 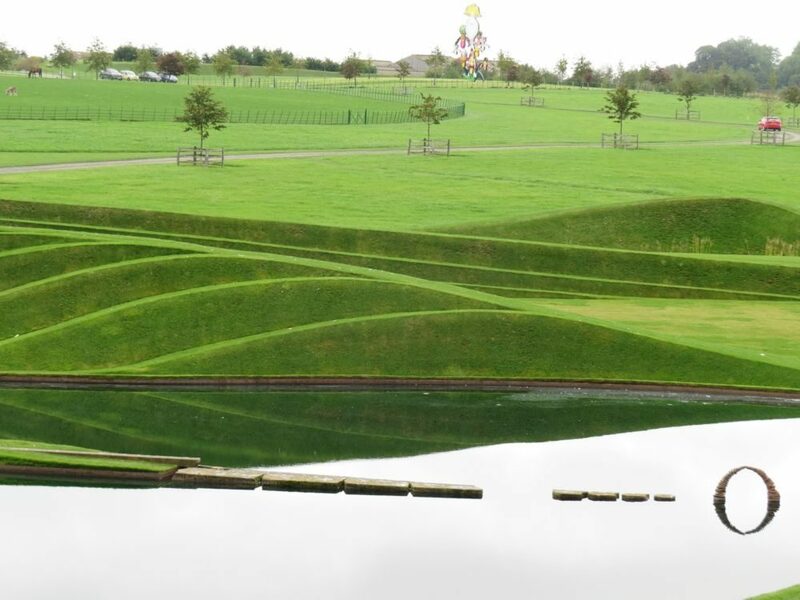 The concept behind ‘Cells of Life’ is the life of the cell and the way it divides, and the installation consists of eight landforms with a connecting causeway, four lakes and a flat grass parterre. Entering the park through a wooded copse the scale of the Jencks’ landforms is a breath-taking surprise. The gently rising and falling paths are a delight for children to explore and for adults to appreciate the changing views. 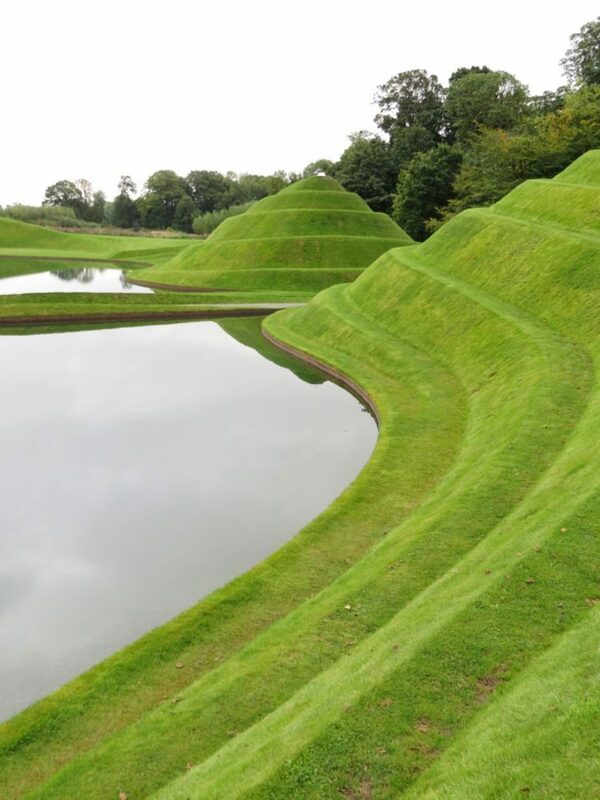 The earthwork banks are well-suited to the Scottish climate staying lush and green in the mists and rain that would turn them brown in drier, sunnier climates but the mowing of the steep grass banks is a major undertaking. ‘Over Here’ by Shane Waltener. 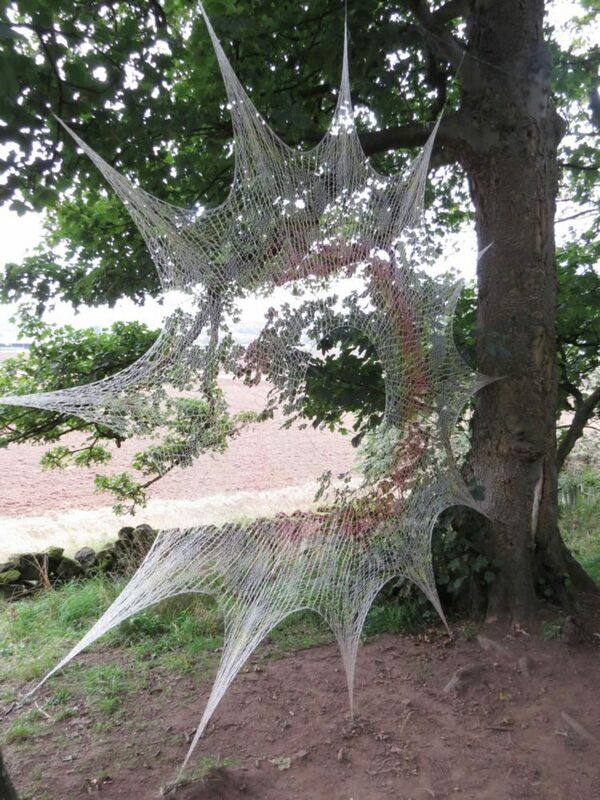 A 400cm wide web of knitted coloured fishing line using a technique inspired by Shetland lace. 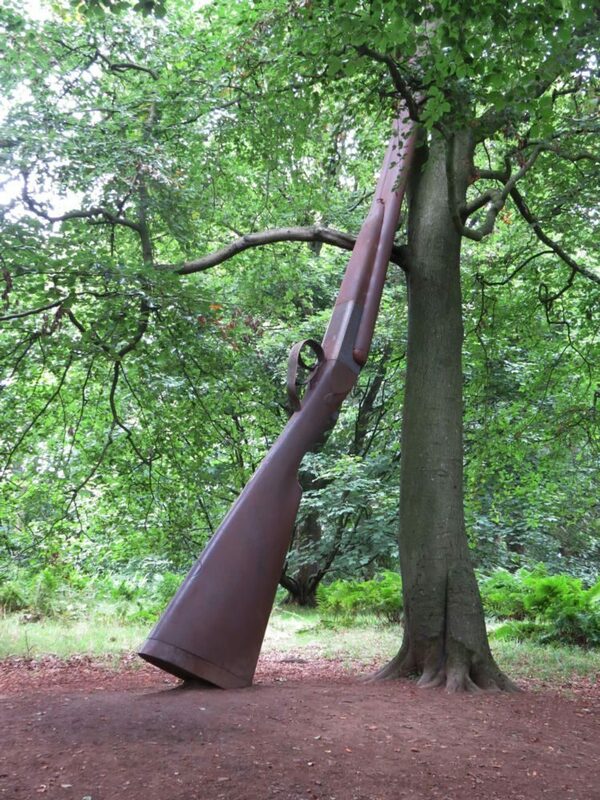 The two dozen sculptures set along the winding paths of the dense woodland are a voyage of discovery, allowing wandering without being directed, and many are by famous contemporary artists including Anish Kapoor, Antony Gormley, Andy Goldsworthy and Ian Hamilton Finlay. 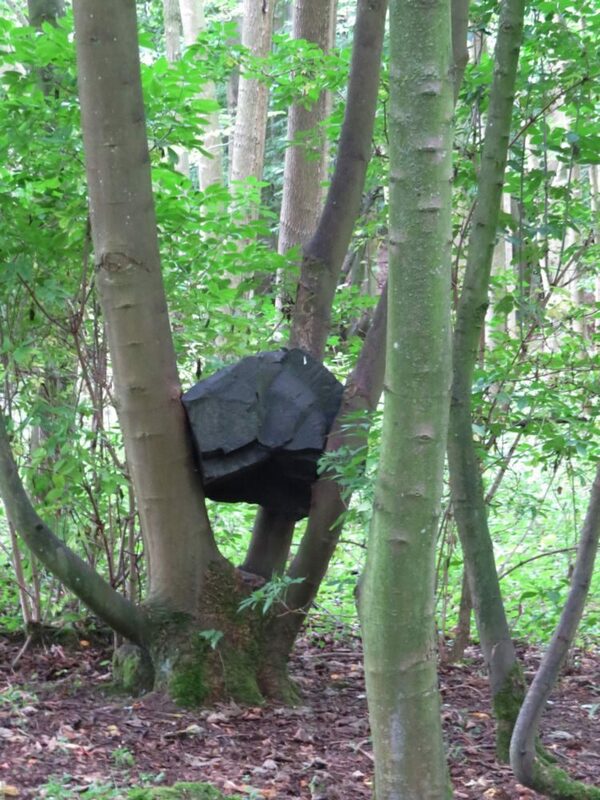 Subjectively, many of the pieces by the lesser known artists surprised and excited me more whilst the glimpses through the trees to the Forth Bridge and the Pentland Hills provided an unexpected pleasure. However, one small drawback is the lack of places to sit on the long trail through the woods. 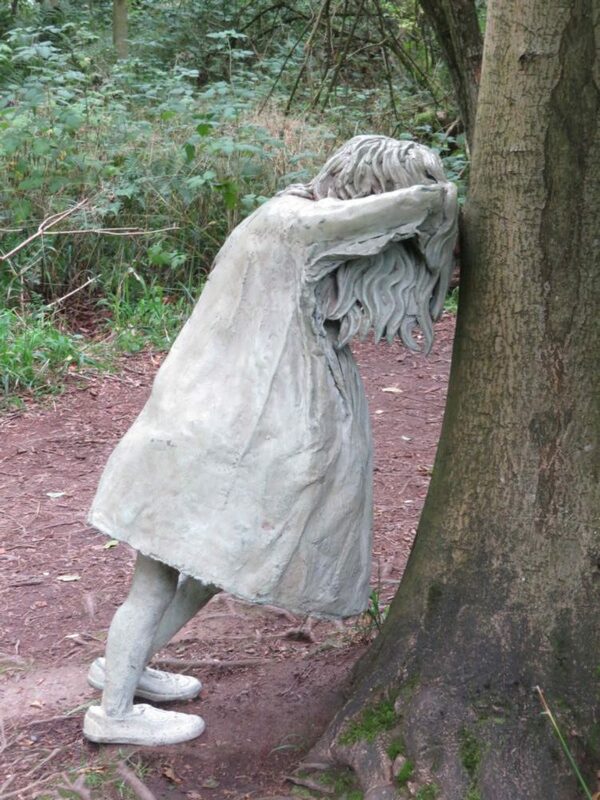 The sculpture park is a testament to the vision of the Wilsons, created from their passion for art rather than seen as a commercial venture, and their wish to nurture that passion, particularly in schoolchildren, with an extensive programme of classes, workshops and events. For me this visit proved to be the unmissable highpoint of a trip to Edinburgh.